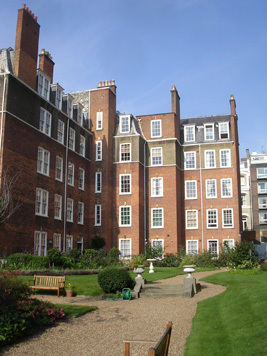 William Martin was appointed to carry out defect diagnosis, produce a 10 year planned maintenance programme for capital expenditure budgeting, design and contract administer the external refurbishment of this prestigous estate. The estate comprises 213 residential apartments with a small number of commercial units built in the early 1900s and had suffered a period of neglect in the 1950s which had not been addressed fully addressed. Working with the client’s estate management team including direct labour, the programme of works includes stripping and replacement of natural slate roofs, stripping and renewal of lead flat roofs, rebuilding of defective chimney stacks and replacement of pot, brickwork repairs and repointing, balcony repairs and reconstruction, dry dashing, timber repairs to box sash windows and external redecorations. The works are carefully planned to minimise disruption and maintain access to the beautiful private gardens forming part of the estate.